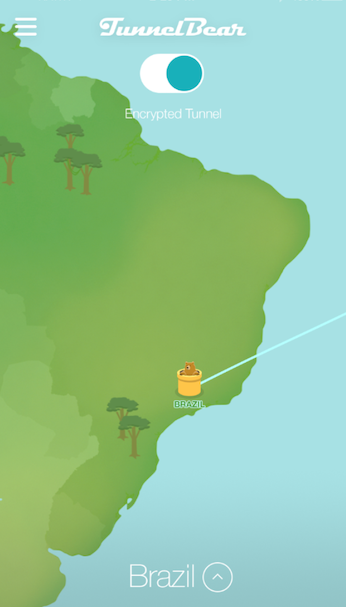 TunnelBear is a relatively young VPN in terms of popularity and definitely one to watch. When they get things right, they are very good, but there are still a few areas in need of improvement. Still retain too much customer information. TunnelBear is still something of a novice in VPN in comparison to some of its rivals, so it has achieved a great deal to get to where they have so soon. There is a lot to praise in the TunnelBear service, but as our review found, there are still a number of areas where they can continue to improve too as well. TunnelBear offers a slightly different pricing model to other VPNs. They offer the usual monthly and annual packages, but they also have a free offer too. This free offer has been given the apt name of ‘Little’ and when it comes to data, that’s exactly what it is. If you choose this offer you will have a monthly data capacity of just 500MB. This is the equivalent of streaming an hour of content on Netflix or visiting a few hundred websites. It is completely insufficient for modern internet users, but what it does do is offer you a good opportunity to try TunnelBear for free. Why they don’t sell it as a free trial rather than a free package is beyond us, but as a free trial, it is a useful feature. Both of these prices are slightly lower than the market average, but it goes without saying that the Grizzly package offers the best value for money by some distance. With the free trial available to see if you like their service, there really is no reason to sign up for their monthly deal. Payment can be made by all the usual credit cards and they also accept Bitcoin payment which is great for privacy-conscious users. Oddly, they still do not accept payment via PayPal. TunnelBear’s terms and conditions make clear that they do not offer any refunds, apart from exceptional circumstances and there is no money-back guarantee. This makes their free package the only chance to try TunnelBear out before committing your money. TunnelBear offers just two types of VPN protocol. If you are using their iOS app on your iPhone or iPad, you will be using IKEv2 / IPSec. While all other apps default to OpenVPN. There is no option to change these protocols, so if you don’t like the one TunnelBear has chosen for you, bad luck, you are stuck with it. TunnelBear is adamant that it doesn’t collect any data about what you get up to online, or details of either your own IP Address or the IP Address of the server you connect to. They are at least upfront about this practice and while it isn’t going to link you to your activity we would much prefer it if they didn’t keep this data at all. TunnelBear’s server offering is fairly modest compared to other VPNs in their price range. They currently offer servers in 22 different countries. The bulk of these are in Europe, with a handful in North America, Asia, and just one in South America. 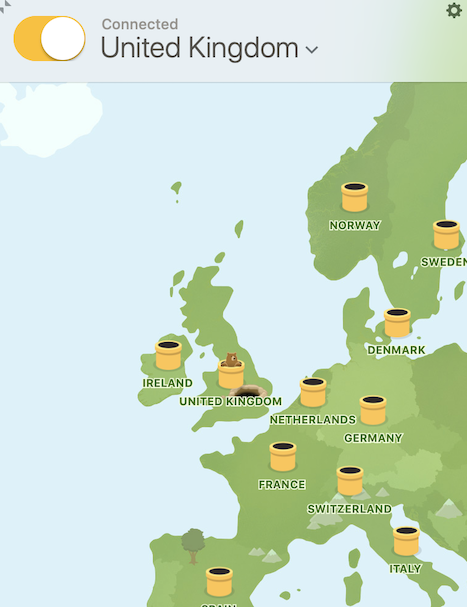 TunnelBear claims that their server network is growing all the time, but since our last review eighteen months ago only two new locations have been added. On the positive side, TunnelBear is no longer referring to Hong Kong as a Special Administrative Region, which is encouraging. TIP: Consider ExpressVPN which covers 94 countries globally. TunnelBear allows up to five concurrent connections with each subscription package. For a long time, this was the industry standard, but with some providers now stretching this figure into double figures and more people having multiple devices to go online with, hopefully, TunnelBear might extend this number in the not too distant future. TunnelBear doesn’t have too many bells and whistles which most users will see as a positive. The focus is on providing a core service that is simple and effective. But there are a couple of extra things worth mentioning. Their GhostBear feature is a neat little tool which helps you to access websites like US Netflix and the BBC iPlayer which try to block access to VPN users. It also makes accessing censored content a great deal easier too. GhostBear works well but it does slow down connection speeds a bit, so is best to use only when needed rather than have it enabled all the time. They also have a function called Vigilant Mode which blocks all unsecured traffic in the event that your VPN connection gets cut or disrupted. This sounds like a supped-up kill switch to us, but it certainly seems to do the job. TunnelBear’s apps are a definite strong-point of their service. They have well designed, fun, and easy-to-use apps for both Apple iOS (think iPhone and iPad) and Android devices which both enable connection with a single click. We tested their iOS app and found it great to use, even for beginners. Their apps all centre on a world map and there is a theme of tunnels throughout. When you connect to a server, the map shows a bear tunnelling from where you are to where the server is. It is a simple image, but if you prefer, you can also choose your location from a list of locations in a drop-down menu. The menu at the top of the page also lets you access other features and settings including an option to set things up differently when using a Wi-Fi or 4G connection. TunnelBear also offers similar apps for Windows and Mac OS computers too. These apps have a similar appearance with a focus on the world map and a similar tunnel design. When you first download the app, it gives you three simple introductory screens to follow. The first tells you how to connect fast by simply choosing a country and clicking connect. It even recommends choosing ‘Auto’ to let TunnelBear connect to the fastest available server. The second reassures that once connected you can use all your apps and any browser with confidence, knowing that TunnelBear is protecting your data. The final screen reassures you that you will be protected at home, at work, or even on public Wi-Fi networks. To be honest, these screens could offer some more practical information, but it is nonetheless a nice thought. Accessing the additional features and settings was a little harder on the Mac app we tested as they were hidden away under the preferences section of the settings menu. But generally speaking, we had few complaints about these apps. If you want to use TunnelBear on other devices, then things get a bit trickier. While there is a browser plugin for Chrome, Firefox, and Opera, and a Blocker tool for Chrome that claims to stop online tracking, TunnelBear offer very little else. They do offer guidance on setting things up manually for Linux, but if you want to use TunnelBear on Amazon devices, SmartTV’s, or anything else, you are out of luck for now. This is definitely one area where TunnelBear has a lot of work to do to catch up with its competitors. To test TunnelBear’s speeds, we have been using it on a regular household internet connection in the UK for several weeks. Our overall conclusion was that, for the most part, speeds were acceptable without being spectacular. However, there were a few occasions when we saw speed drop for no obvious reason. This happened on various different servers located both in the UK and overseas. Apart from these occasions, we found speeds perfectly ok for everyday online activities like checking emails, streaming video, and downloading. These speeds are not exceptional but neither are they the worst we have seen either. For everyday tasks, you should find TunnelBear more than sufficient, unless you encounter the same unexpected drop-offs that we did. As we have mentioned above, TunnelBear defaults to OpenVPN for most apps, but their iOS app will use the IKEv2 / IPSec protocol. All of their encryption uses 256-bit AES encryption which is the industry standard and more than secure enough to keep your data safe. TunnelBear is one of the few VPNs to have carried out an independent audit of their online security. This audit was first carried out by Cure53 in 2017 and found a number of vulnerabilities which have now been fixed. They looked again in 2018 and found a handful of new problems which have also been resolved. TunnelBear has been very open about the type of problems which were identified, which is to their credit and we would like to see more providers follow their lead. As we have noted above, TunnelBear does collect rather more data about its users than we would like to see. However, they are adamant they do not collect data about what you are doing online or IP Address details. We have seen no reason to doubt them on this, but there is no doubt that TunnelBear could do more to make their privacy protections even more robust. There is much to praise about TunnelBear, but there are also some areas where there is still room for improvement. We like their apps very much and if you are new to VPNs then TunnelBear will certainly be a good provider to ease you into the technology. They offer solid, independently-verified security and their encryption is robust. Their connection speeds are pretty good for the most part and their pricing is reasonable too. However, their server network is still small and hasn’t expanded much since our last review, which is disappointing. Their privacy policies are ok, but they still retain too much data for our liking really. There is also a lack of apps for other devices which will frustrate some users and the market is now also leaning towards offering more concurrent connections, which we would like to see TunnelBear follow. Lastly, while their limited free service offers a good free trial facility, the absence of a money-back guarantee will definitely put some users off.